After three weeks and 60 apartments and extremely sore feet, we finally found it. Back up on the Upper West Side, near the park. Quiet, no obvious flaws. NB: flaws seen in others apartments included multiple mouse traps, broken windows, crime scene tape, in the middle of a building site, and a bathroom so small you had to step on the toilet to get to the tub. So it’s goodbye to the Village and goodbye to the balcony. The herbs have been taken away by Katherine and Duncan to pastures new, but before they arrived I picked as many as I thought I could get away with and preserved them against the Autumn to come. 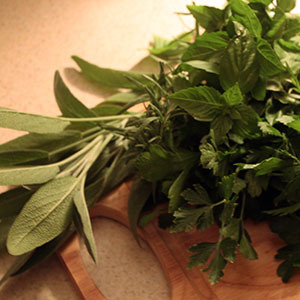 Preserving herbs is most traditionally done by drying. 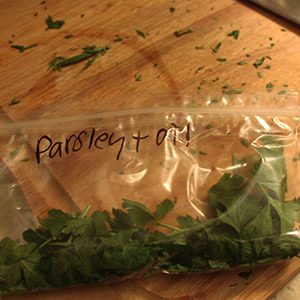 But then the herbs taste like dried herbs. 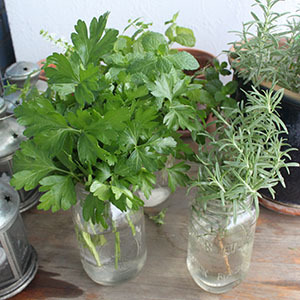 Freezing in oil or butter stops the herbs from drying out, so they taste more like fresh herbs when you de-frost them. Cover with oil or melted butter, freeze. That’s it. Summer stored away for a rainy day. Crime scene tape? Good grief! You’ve often commented on the small kitchen in your current apartment – is the new one any better? Hope the move goes well – I too hate having to move – and look forward to reading posts from the new address. We’re moving to an ever-so-slightly larger kitchen, which is great! Just three weeks in limbo before we can get the keys … exciting times!